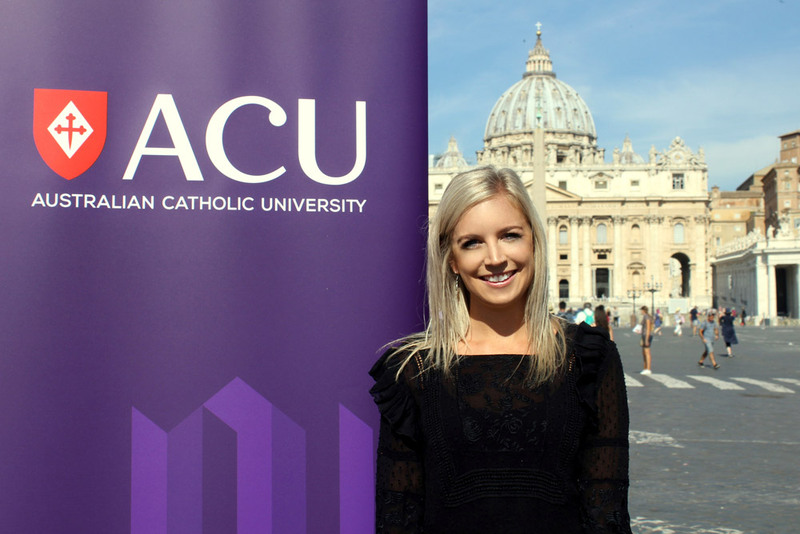 Kate Gavin is the recipient of the 2018 Francis Xavier Conaci scholarship which will assist her to study at the Australian Catholic University (ACU) Rome Campus. ACU and the Australian Embassy to the Holy See will host a ceremony in Rome on July 11 to present Kate with this prestigious award. The Francis Xavier Conaci scholarship enables an Australian Aboriginal or Torres Strait Islander student to undertake study in Rome as part of their Core Curriculum requirements. 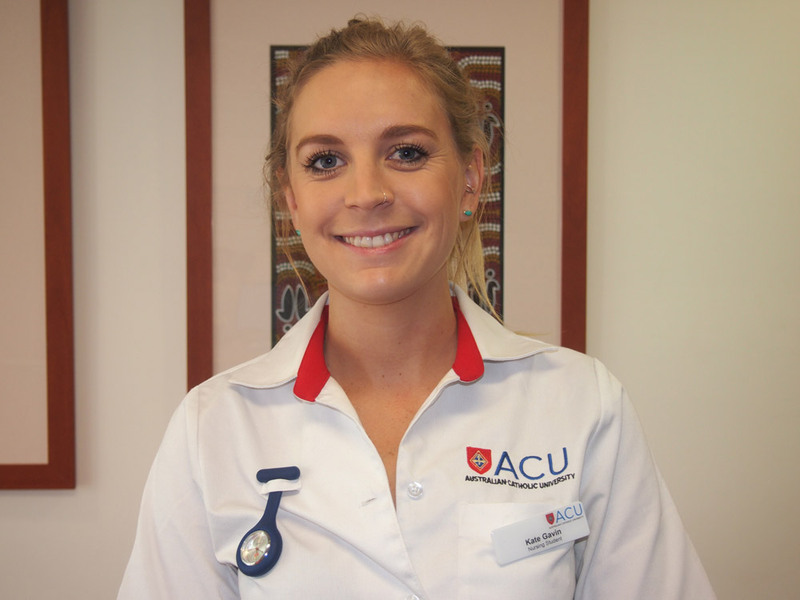 A third year Bachelor of Nursing student at ACU’s Brisbane Campus, Kate is an Aboriginal student from Noosa whose grandfather was part of the Stolen Generation and knew little about his biological family. He was taken from his mother and raised in an orphanage in Perth. Despite this, Kate and her family have managed to stay connected with family in Perth and their Indigenous heritage. Kate aims to secure a position in a paediatrics, cardiology or oncology ward when she graduates this year and plans to return to university in the future to study midwifery. “Kate was selected to receive the Francis Xavier Conaci scholarship due to her strong academic record as well as her willing contribution of her time to supporting other students at the Weemala Indigenous Higher Education Unit at the ACU Brisbane Campus,” said Ms Ceolin. “It is fitting that such an inspiring young Aboriginal woman has received the scholarship with the NAIDOC Week theme reflecting the importance of Aboriginal women in our communities and families. Kate serves as the ideal role model to her fellow students,” said Ms Ceolin. Kate said she was delighted to receive the award and that she was excited to be studying at the ACU Rome Campus. “I feel honoured as a woman of Aboriginal heritage to receive this scholarship and to engage in a unit of study that looks at the disadvantage experienced by people all over the world, in particular Indigenous communities,” Kate said. “To receive this scholarship meant that I could study and be immersed in another culture, a unique experience like no other,” she said. The scholarship was established in recognition of an Aboriginal seminarian, Francis Xavier Conaci, who travelled to Rome in 1849 from New Norcia in Western Australia to study in a Benedictine monastery. Conaci died in Rome and is understood to be buried with other Benedictine community members in a grave in the Basilica of St. Paul’s Outside the Walls. ACU is committed to providing education opportunities and supporting success of Aboriginal and Torres Strait Islander peoples through the First Peoples and Equity Pathways Directorate and Indigenous Higher Education Units located at each campus, as well as scholarships and bursaries.